I wanted to let you know about the wholesale stock tea parcel that I have. These overstocks have very high quality packaging! Let me know if you would like to buy it. The stock is ex-Brisbane, Australia. Cubes – 1632 Cartons – 48 Cubes per carton – each cube has 20 teabags individually boxed. All tea flavours are available in boxes of 20 individually wrapped silk tea bags, packets of 50 tea bags or 500g Tins of loose leaf. 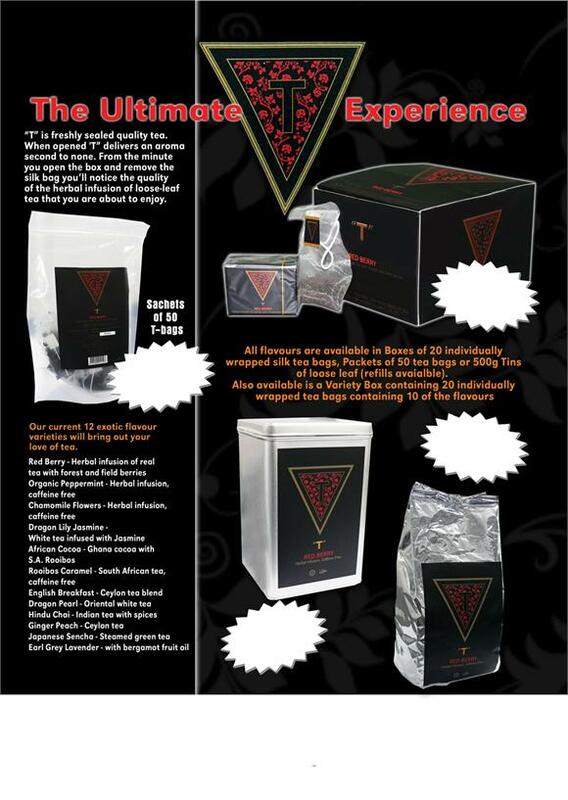 Also available is a variety box containing 20 individually wrapped tea bags containing 10 of the flavours. This surplus stock tea parcel is a delight for any serious tea lover, and because of the premium quality packaging, they would appreciate the extra thought that has gone into this tea selection. “T” is freshly sealed quality tea, when opened “T” delivers an aroma second to none. From the minute you open the box and remove the silk bag you will notice the quality of the herbal infusion of loose-leaf tea! Since this is a wholesale stock parcel of tea overstocks, of course the pricing is extremely attractive. Contact us to find out more about this excess inventory.